What are the potential costs involved? Is it possible to combine a Back/Buttock lift with other procedures? This procedure will remove excessive skin and tissue to recreate a more natural shape to the lower back and buttock regions. When patients have lost a considerable amount of weight, this can lead to a redundancy of excess skin on the posterior part of the torso. The nature and pattern of the excess skin differs dramatically between individuals. It is possible to tailor an operation so that the precise areas of excess skin are removed. The exact pattern of the excision will differ between individuals. This is usually done as a horizontal excision of skin and fat. This operation can frequently be performed with an abdominoplasty or tummy tuck which will result in a circumferential scar running around the body. This is also known as the “Belt” lipectomy. Please note that this is a reference to the final scar that runs around the body like a belt, and is not related to my surname. This will lead to an improvement in the contour and definition of the back as well as the upper part of the thigh. The scar is generally concealed by the patient’s underwear. It is also possible that a patient could have the fat under the skin sculptured in order to create a buttock mound and then the skin is re draped over the surface of the newly augmented buttock. This combination will produce a more defined gluteal or buttock prominence which will help to restore the contour. This is an area that is classically deficient in volume and lacks definition in patients who have lost a significant amount of weight. These can be broken down into those general risks for any procedure and those specific to the procedure. Specific risks include asymmetry both in scars, umbilicus and the skin contour, loss of fat and skin (necrosis), wound breakdown, collections of fluid underneath the skin including serum (seroma), blood (haematoma), pus (abcess), damage to the deeper underlying intra abdominal organs and permanent numbness of the lower abdominal skin. Smoking will significantly increase the risk of these complications as does obesity. It is important that a patient’s health is maximised before surgery to minimise these risks. This includes ceasing smoking at least three months before the surgery. In addition, if one can obtain the ideal weight prior to surgery then the benefit of the operation is maximised. Subsequent alterations in body weight including gain and reduction may reduce the long terms effects of the abdominoplasty. General risks include bruising, swelling, bleeding, wound infections, anaesthetic related problems and problems related to abnormal scarring (hypertrophic, keloid & stretched scar). It is possible to perform liposuction to the flanks “love handle’ area as this area is not directly involved with the surgery and does not increase the operative risks. Dr Belt’s fee, an assistant’s fee, theatre fee, day bed and price of overnight accommodation, specialist anaesthetist fee and the cost of two support garments. Our fees attract rebates from Medicare and Health Funds, please contact Dr Belt’s rooms for a specific quote. 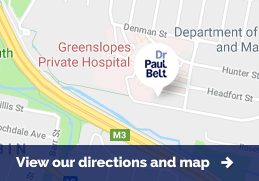 Dr Belt will only perform this surgery under the control of a General Anaesthetic administered by a specialist anaesthetist. This surgery is usually performed as an inpatient and patients can be expected to stay at least one night in hospital. Drains will be inserted into the wounds which exit below the wound through the midline of the abdomen just above the mons area or from the sides of the wounds. These may stay in for a number of days after surgery if the drainage is excessive. Most patients have the drains removed 3-5 days after the surgery. You will be expected to wear a support garment around the abdomen for a period of six weeks. You will be seen daily whilst an inpatient then at regular intervals usually for a period of 12 months. It is possible to perform a Back/Buttock lift with multiple other procedures. These may include breast surgery (augmentation, reduction and lift/mastopexy). The advantage of combining these procedures is that it leads to a complete transformation of the appearance of the anterior part of the torso. There may also be significant cost advantage to the patients by combining procedures.